The ZIP Code Turns 50 Today; Here Are 9 That Stand Out : The Two-Way The U.S. Postal Service began using the five-digit ZIP code in 1963. In recognition of the anniversary, we've examined the list of more than 40,000 ZIP codes and highlighted a few that deserve extra attention. Each black dot represents the geometric center of a ZIP code. Today marks the 50th anniversary of the Zone Improvement Plan, the network of ZIP codes we use for everything from mail delivery to credit card security. The U.S. Postal Service began using the five-digit codes on July 1, 1963, hoping they would improve the efficiency and speed of mail sorting. Since then, the codes have assumed a role in the identities of many Americans, helping to define where they live or work. This New York City ZIP code includes the Chelsea neighborhood in Manhattan and, according to the Census Bureau, contains more businesses than any other in the U.S.: 7,227. Those businesses employ more than 136,000 people. The national average number of businesses in a ZIP code, by contrast, is 188. This ZIP code covers posh Beverly Hills, Calif., and was also the title of a popular teen TV drama series in the 1990s. Brenda and Brandon Walsh moving to "Beverly Hills, 90209" just doesn't have the same ring to it. This rural area in Tonopah, Nev., has the largest ZIP code in the lower 48 states. At 10,000 square miles, it's a little larger than the state of Maryland. The area experienced a boom in the early part of the 20th century after silver was discovered there. It sits about halfway between Las Vegas and Reno, Nev. The population in this El Paso ZIP code exceeds 114,000, according to the Census Bureau's "zip code tabulation area" database, which contains population and demographic statistics. That's more than any other ZIP code. 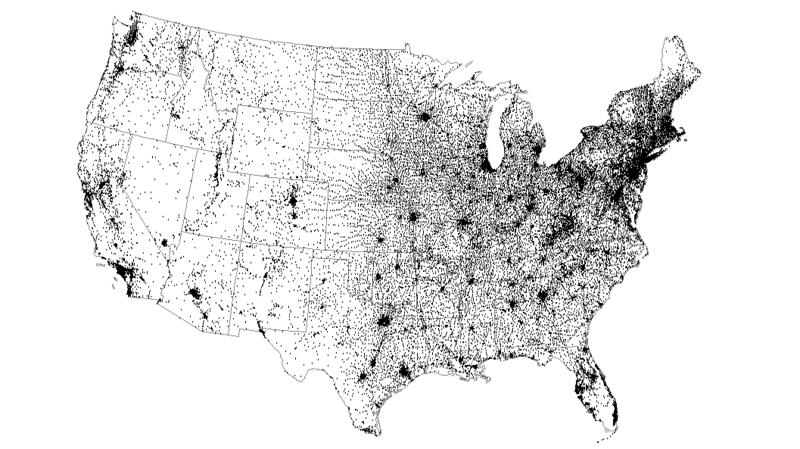 In many cities, ZIP codes cover small areas. But El Paso's includes large, residential neighborhoods on the city's east side. Next on the most-populous list is 60629 in Chicago. A two-block area across the East River from Manhattan, this ZIP code in Long Island City is among the smallest in the country — at a tenth of one square mile. It boasts 1,400 people in that area, though, pushing its residents-per-square mile rate to the top of the list, according to Esri. This North Sacramento, Calif., ZIP code is among the most diverse in the country, Business Insider reported last year. Race and ethnic groups are more evenly distributed here than in most places, meaning residents are more likely to encounter people who are different. The population broke down along these lines: Asian, 20.4 percent; black, 15.8 percent; Hispanic, 27.4 percent; white, 29.2 percent; and multiracial, 5.2 percent. See other diverse counties here. The population in 38639 (Jonestown, Miss.) is 99 percent black. The reverse is true in 02562 (Sagamore Beach, Mass. ), where 99 percent of the population is white. Residents and political action committees in this Las Vegas ZIP code spent more money in the latest election cycle than they did anywhere else — $96 million, according to the Center for Responsive Politics, a nonpartisan watchdog group. The 89109 ZIP includes many of the city's marquee casinos, and it's likely that much of the campaign funds came from one source: Casino executive Sheldon Adelson. Perhaps the biggest donor in American politics, he vowed last year to spend as much as $100 million to defeat President Obama. This is by no means a comprehensive list of interesting ZIP codes. Tell us about yours in the comments. You can also download some of the data used in this post here. UPDATE: Esri added its own interesting and useful take on these ZIP codes on Tuesday. Check it out. Matt Stiles is data editor on NPR News Applications team. Follow him on Twitter at @stiles.